New Heritage Realty and Development, Inc. Welcome to New Heritage Realty and Development, Inc. This home has 3142 square feet of finished heated space, 126 sq ft of rear covered porch, and 626 sq ft of garage space. The total floor space under the roof is 3,817 sq ft. This house was designed by Mickey DeBernard and Arnold Burns. The front facade of this home takes on a Brick Colonial look, with styled designer windows and a stately setting, while the rear features a fixed window Carolina Room and Covered Porch. An all brick exterior with box vinyl cedar shake shingles influences the richness associated with this Colonial styled home. After walking through the elegant crystalline front door, one is immediately enticed by the formal Dining Room with two-piece crown moldings and hardwood floors. Unique “squared” columns and half walls have been incorporated into this room, providing formalness while allowing the beauty of the front Dining Room window to be exposed throughout the main living area. A custom designed center fireplace and built-in bookcases were hand drawn and built by Mike Bower. The placement of this unit continues the homes elegant theme into the openly spaced Living Room, while the use of a half wall into the Carolina room ensures an abundance of natural light. On the split wing there are two similar sized bedrooms that share a hall bath and an upstairs Bonus Room with a full bath. The 14x6' dormer extension of the Bonus Room above the Garage creates a separate living or studio effect and achieves tremendous additional light. On the opposite side of the house, the bright and cheerful Master suite features a lovely Sitting Room/Study in the front with a stunning bay window. The Sitting Room enhances the Master Suite while keeping the demeanor of a home this size. The Master Suite also presents a large bathroom with elegant tile work, including a marble pan shower with decorative tiled walls. Separate energy efficient heat pumps were used for both the down stairs and Bonus Room portions of the home. As always, high quality insulation was used throughout the house. 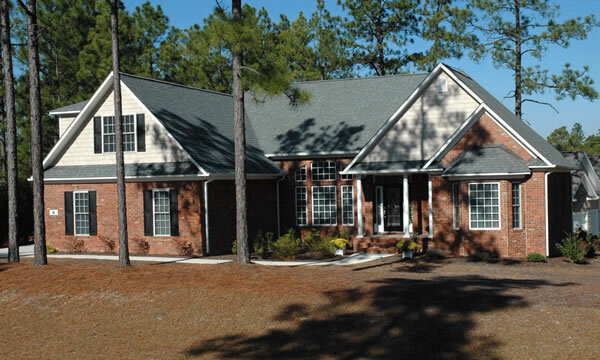 This home was built on a beautiful oversized corner lot in the Pinehurst #6 subdivision. The rear of the home was designed with a Screened Porch behind the Breakfast Room that has access into the Carolina Room. A Covered Porch with shed roof was added and tied back into the original roof line. This achieves a marvelous outdoor sitting area where one can enjoy the backyard privacy.